Captain of the USS Enterprise, Captain James Tiberius Kirk is one of the most renowned Starfleet leaders. Kirk leads his crew to the far reaches of space, Where No Man Has Gone Before. Regarded as a maverick, Captain Kirk strays from the path of Starfleet regulations, but only when the ends justify the means. 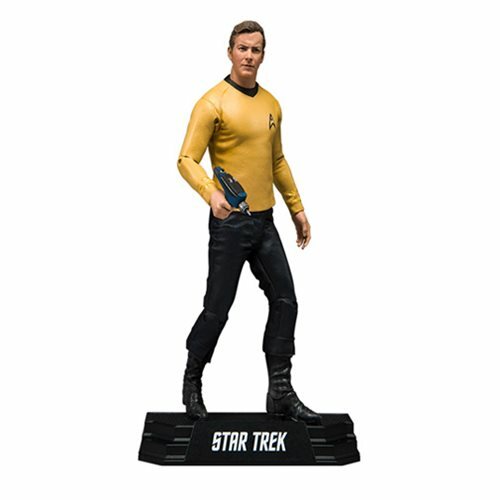 The Star Trek Series 1 Captain Kirk Action Figure comes as a 7-inch scale collectible. The Captain James T. Kirk action figure is sculpted from images of actor William Shatner. Captain Kirk comes with a Phaser, Communicator, and Phaser Rifle. Ages 12 and up.